We hope you like them as well! It’s February and I am sure you can smell spring in the air, we do here in Boulder! So in honor of the coming spring season, get outside for a work break – but before you head out, take a look at this 50-cm color WorldView-2 imagery collected over the 2018 Australian Open on January 28, 2018 at approximately 11am local time. We have featured the Aussie Open in the past so we will not repeat those details. On this particular day, the Men’s Final was held in the evening (at approximately 5pm we believe) where Roger Federer defeated Marin Čilić for his 20th Grand Slam victory – congrats Roger! Have a great rest of your workday! 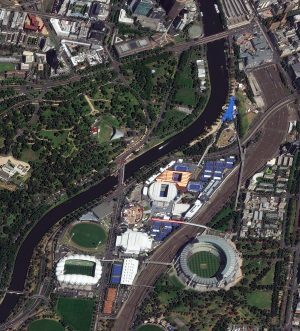 This entry was posted in The Geospatial Times and tagged Australian Open, The Geospatial Times, Tips & Tech, Your Imagery Work Break by Apollo Mapping. Bookmark the permalink.